We had a wet one at Doyle field for the Leominster home opener, but it was visiting Wachusett who would come away with the win, 27-10. Though the first half stayed tight, the Mountaineers broke it open after an extended intermission. As you may have guessed, two powerhouse teams with strong offensive and defense lines playing one another in the rain, this was going to be a smash mouth running game. Despite a few nice connections between Noah Gray and Allen Link of Leominster, neither team got the passing game going. In fact, neither team tried particularly hard to throw at all when it wasn’t necessary. The result in this one came down to who won the battle up front. Tonight, some of the warriors included Pat Walsh, Zach Nadeau, Harry McDade, Anthony Lombardi, Will Wiegand and the rest of the Wachusset offensive line. They were absolutely dominant against a talented Leominster front seven. Last week these guys cleared the way for Josh Furtado to have a big game, this week, they did the same for Anthony Behonick. 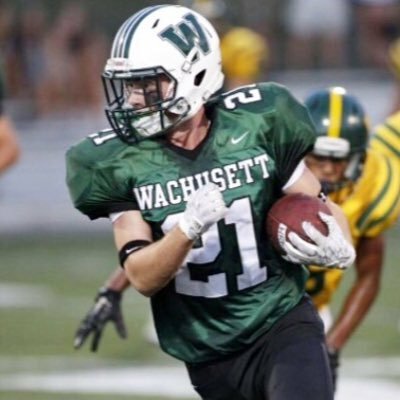 He had two touchdowns and a two-point conversion on the evening for Wachusett, as well as a few big runs where it seemed like he carried three Blue Devils with him. On the other side of the ball, Leominster just couldn’t find a rhythm on offense. Wachusett’s front seven really came to play Friday night. It was evident that there was a lot of frustration coming from the Blue Devil bench as they struggled to find their footing. Despite senior running back Anthony Dandini being the absolute monster he is when it comes to running over defenders, the offensive unit just couldn’t find the first down marker consistently enough. It looked like Leominster may have turned things around for the better when heading into halftime, the rain temporarily ceased. During this time, Noah Gray and the Blue Devil offense engineered an impressive 30-second drive to put themselves well within scoring range. They came away with a field goal and some momentum going into halftime. However when the extended Homecoming Halftime Ceremony ended and the rain returned, it seemed like some of that steam they built up had worn off. A disappointing loss for the Blue Devils, no doubt. The score was a little more lopsided than many people were expecting, but this is a really strong Wachusett team they played. The night’s slick conditions took away some of Leominster's most lethal plays, especially in the passing game. That being said, this team knows its identity. They know they can bounce back from this. It will only be a matter of refocusing. It’s hard to pick against them any given week because of the talent on the roster, both offensively and defensively. Everyone has their good nights and bad, and it seemed like the ball just wasn’t bouncing in Leominster’s favor this time. Look for them to regroup and come back very strong at home next week against Algonquin. What a statement game for the Mountaineers. Wachusett dominated the second half of this ball game. It’s tough to game plan for a team with as absolutely stacked backfield as this, especially when they let a different guy run loose each game. Anthony Behonick looked like he could’ve run through solid brick wall last night. As for the defense, they were relentless. Every down they would give Leominster all they could handle. The pursuit by the front seven was stellar, often times resulting in tackles for negative yardage. All eyes were hungry for the ball carrier and they tracked phenomenally. With the passing game minimized, Leominster was not able to run the football effectively against this tenacious defense. After the game, head coach Mike Dubzinski was highly complementary of his defense, citing their work ethic and effort. He also gave props to his offense however, saying how much they helped out on the back end. “Sometimes your best defense is your offense,” Dubzinski said. And it’s true, Wachusett dominated the time of possession in this matchup, allowing the defense to come on the field, well rested, execute their strategy, and get off the field again. So far, this mentality has gotten Wachusett to a 4-0 start. And if it ain’t broke, don’t fix it.